Don’t worry if you’re not familiar with mutual funds. Our website is designed to suit everyone, whether you are a mutual fund novice or a veteran. Thai Funds Today! provides a simple and user-friendly platform that makes tracking and investing in mutual funds much more enjoyable! To help you take advantage of the features we provide on Thai Funds Today, we have created a short tutorial that will help you navigate through our website smoothly. You can use the menu on the left to skip to the section you are interested in. Let’s start with the basic layout of the website. To get to the home page, simply click on THAI FUNDS TODAY or the button. If you have an account, you can sign in by clicking on the “Sign in” button on the top right corner or by clicking on “My Portfolio” link. If you would like to create an account, click on the Sign up - it's free button on the top right of the screen. If you already have an account with us but forgot your password, go to the “Sign in” page and click on the "Reset Password" link. Information on Thai Funds Today is provided in both Thai and English. To switch the language, click on the button at the top right corner. There is also a search tool on the top that allows you to look for a mutual fund by typing in either the fund symbol or the fund name. There are also four quick links: First time here?, Fund Price Info, Fundtastic Selector™, My Portfolio. Click on the New update button above the quick links to learn about all the new features that have recently been added to the website. The Fund Price Info page displays a summary of current mutual fund prices with the daily, weekly, 1-month, 3-month, 6-month, 1-year, 3-year, and 5-year performances. 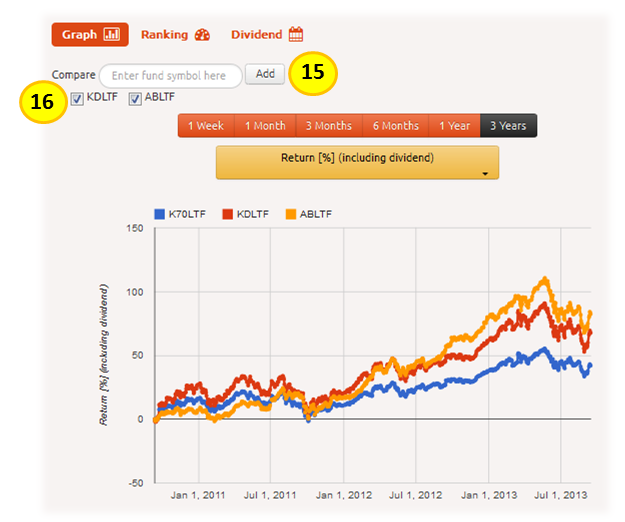 All data include dividend information using the Modified Dietz method. The latest date that Thai Funds Today updates the price information is displayed on the top left corner just above the fund price table. Performance data are organized into Short Term and Long Term . Short Term includes daily, weekly, 1-month, and 3-month performances whereas Long Term include 6-month, 1-year, 3-year, and 1-year performances. The Dividend tab displays the annualized yields, the payout frequencies, the latest payout dates, and the latest dividend amounts. The performances can be viewed in Baht or in percentage return. To switch between information displayed in Baht and percentage return, click on "%" button or "฿" button. 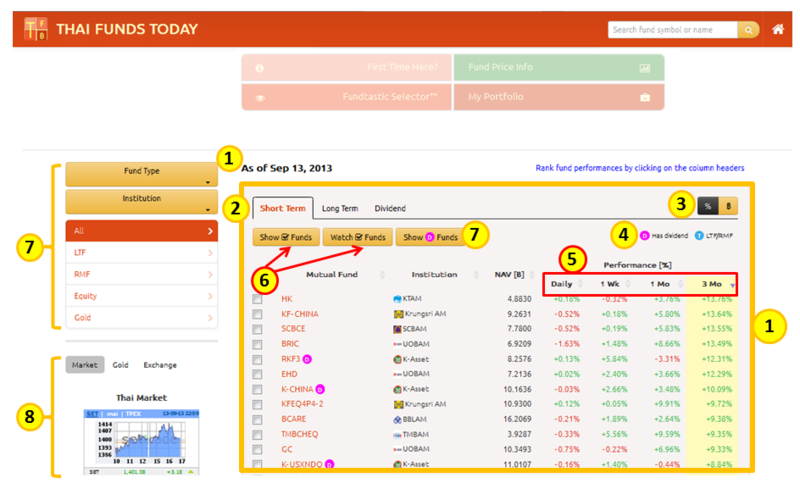 Funds with dividend are annotated with D while LTF/RMF funds are annotated with T .
You can rank fund performances by clicking on the appropriate performance column headers. Select specific funds you are interested in with the checkboxes in the leftmost column and click on Show Funds to show only the selected funds, or click on Watch Funds to add the selected funds directly to your watch list (sign in needed). You can also filter the displayed list by the mutual fund type or by the institution that issues the funds. We also provide pre-filters for the most frequently visited groups (such as the LTF, RMF, equity funds and gold-related funds ). 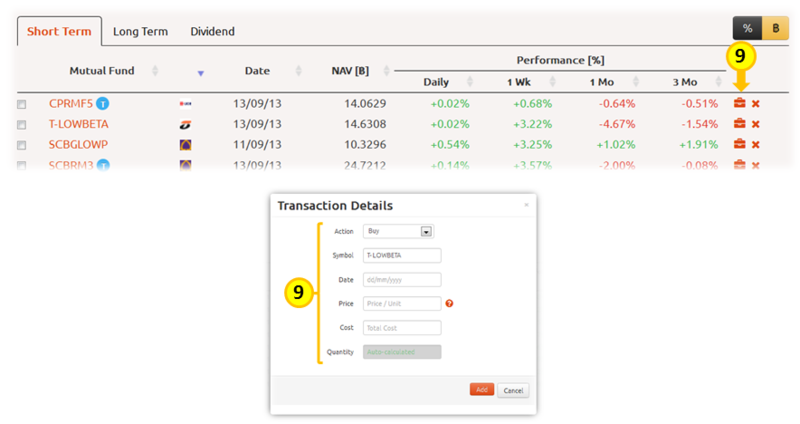 You can filter the list further to show only dividend funds by clicking on the Show D Funds button. On the left hand side below the quick links, we also provide the current information on stock market, gold price and the exchange rates. Click on the tabs to display the respective information. For stock market, both Thai and world market indices are provided. For gold market, US gold price as well as the SPDR gold share information are provided. 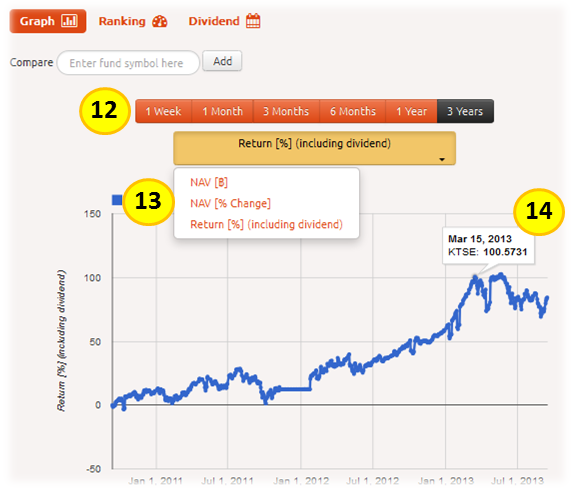 You can click on each mutual fund to get more information about that particular fund. On the individual fund page, you will find additional information such as the fund type, the inception date and the risk factor. If you would like to get extra information on that mutual fund, you can click on the More Info link. Click on Watch This Fund button to add the fund to your watch list. Detailed price information within a certain time period is displayed on the graph. You can choose to view the information in the different time windows (1 week, 1 month, 3 month, 6 month, 1 year and 3 years). On each fund's page, you can choose to view its past performance in NAV [฿] , in % Change in NAV , or in % Return over the period (this takes into account the dividend). 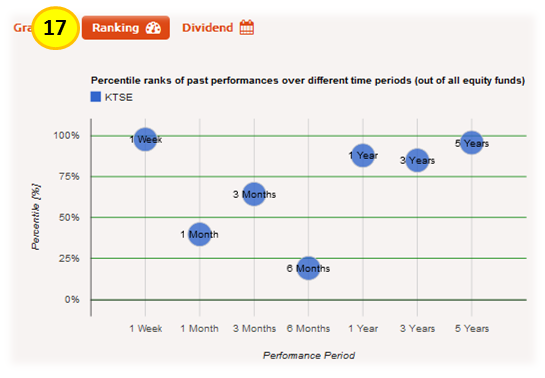 The last option is only available if any of the funds being compared on the graph has a dividend. The price on a particular date is displayed when you move your cursor along the graph line. You can also compare another fund on the same graph by typing the fund symbol that you would like to compare in the box, then click "Add" . If you would like to remove the fund from the graph comparison, simply uncheck the box in front of the fund you want to remove. For each fund, we plot the percentile ranks of its past performances over different time periods (compared to the rest of the funds in the same category). The higher the percentile value, the better the rank. For example, a fund at the 75th percentile means that 75% of all the funds being compared have performed worse than this fund (over a given time period). This chart will help you see the consistency of each fund's performance over time. For the funds that pay dividend, we have also put each fund's dividend information on its own tab for your convenience. 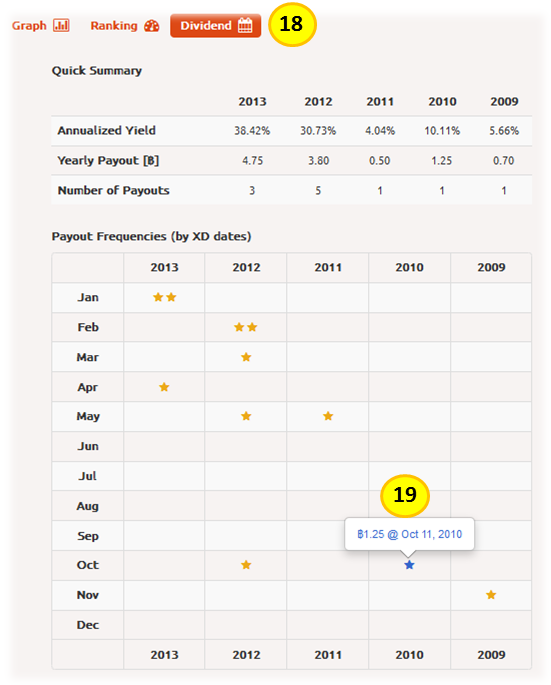 You can roll your mouse over each to see the details of that particular dividend payout. If you are looking for new funds to invest, our Fundtastic Selector™ can help generate new fund ideas. Fill out your investment preferences in the "Investment Preferences" panel and click on the "Find Funds" button. The default risk data source is based on the information from the asset management companies. Signed in users will also have an additional option to assess risk using our TFT Risk Estimator™ which estimates risks based on the fluctuations in historical prices. A list of funds will show up in the "Suggested Funds" section once you have filled out your investment preferences. 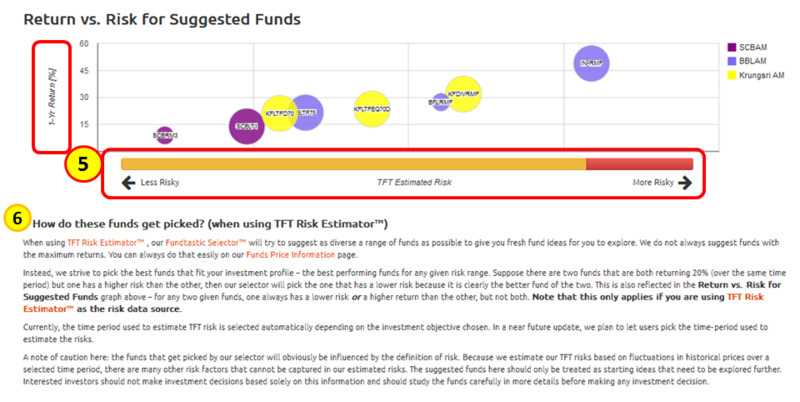 The data in the TFT Risk column (only available to signed in users) are represented by color-coded bars. The fuller the bar, the higher the risk. The bar is green for low-risk (conservative) funds, yellow for medium-risk (moderate) funds, and red for high-risk (high) funds. For Signed in users, the suggested funds are also shown on a chart representing their trade-offs between Return (y-axis) and TFT Risk (x-axis). Obviously you would like to invest in funds that have the highest returns with the lowest risks so the perfect fund would be found at the top-left corner of the chart with infinite return and zero risk. In practice, there is usually a trade-off between risk and return. If you want funds that generate higher returns, you usually will have to tolerate more risks. An explanation of how our Fundtastic Selector™ selects its funds is given below the Return vs. Risk chart. Note that there are many other risk factors to fund investments that cannot be captured by historical price fluctuations and therefore will not be represented by our TFT estimated risks. Moreover, past performance of the funds are no guarantee of their future results. Please consult the approriate asset management companies and your investment advisors before making any investment decisions. Registering an account with Thai Funds Today gives you lots of benefits. You can create a watch list of the mutual funds that you would like to follow and may be interested in purchasing. You can also create a portfolio where you can keep track of all your fund transactions in one place. Once you are signed in, you will see two tabs: My Portfolio and Watch List Details . We display your portfolio name and value on the upper left hand corner. To add a fund to your watch list, first click on the Watch List Details tab, then click "Watch New Fund" . A dialog box will then pop-up. Type in the fund symbol and click "Watch It!" . The watch list displays information about the funds in a similar manner to the Fund Price Info page, but with an extra column for the date when the price was last updated. 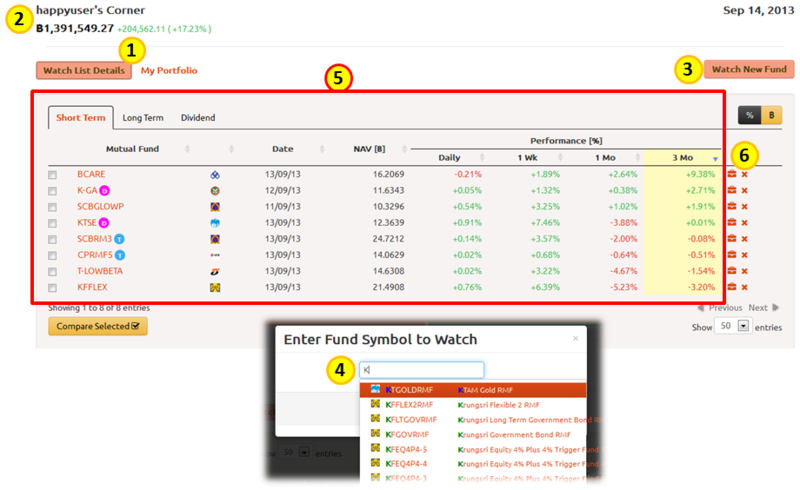 To remove the fund from the Watch List, simply click on and then OK .
To compare selected funds directly on a graph, select the funds with the checkboxes in the leftmost column and click Compare Selected button. 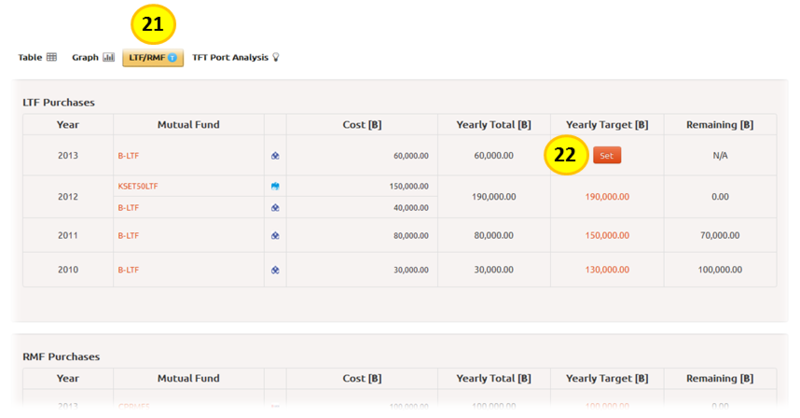 A graph comparing the funds will appear below the table along with the graph period and graph type options just above the graph. The options avaiable for graph types are NAV (NAV [฿]), % change in NAV (NAV [% change]), and % return (Return [%]). The last option, % return , factors in dividend information using the Modified Dietz method so that you can make a fair comparison between the performances of different funds. To add the fund in your watch list to your portfolio, click on then enter the transaction details (fund symbol, type of transaction, date of transaction, fund price per unit, and total cost). The fund price per unit will be determined automatically if the data is available but you can always manually override this field if the data is incorrect or not available. 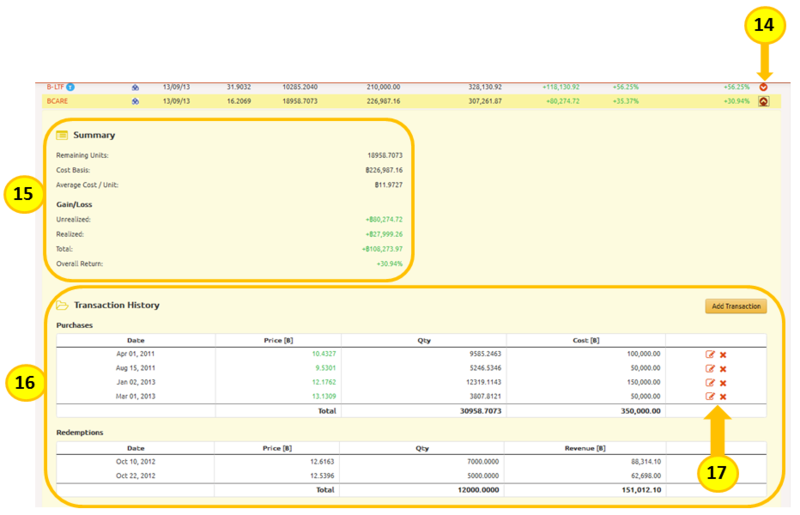 Note that if you enter the fund price (per unit) manually, it should be entered to the demical place (for accuracy). Once the fund is added to your portfolio, it will show up under My Portfolio tab. You can then select whether you would like to view the portfolio in table format (default) or in graphical format. The table will display the NAV, number of fund units, cost, up-to-date market value and the gain (in green) or loss (in red) in both Baht and percentage. At the bottom, we display the total cost basis, the market value and the net gain/loss for all mutual funds you have added to your portfolio. 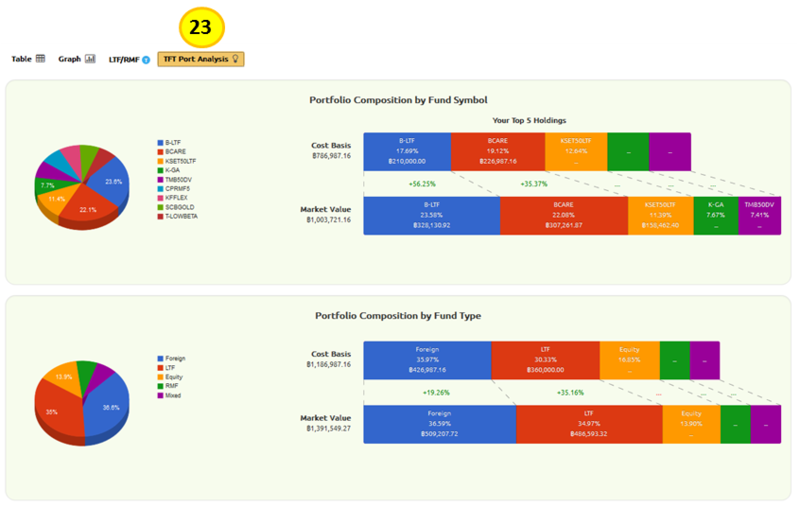 The total market value and the net gain/loss are also shown on the upper left hand corner under your portfolio’s name. 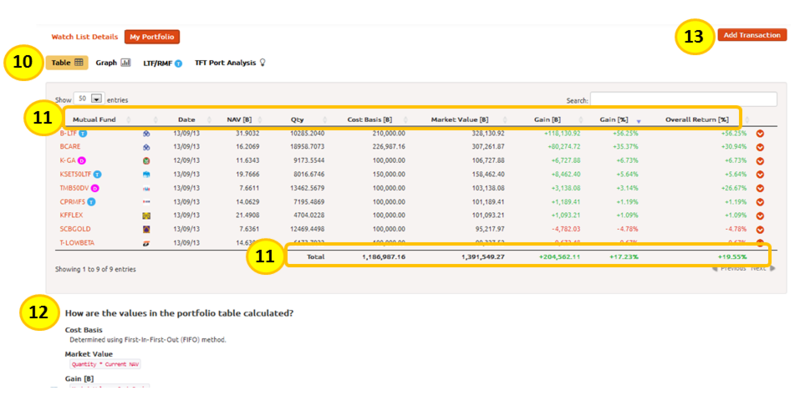 An explanation of how the values in the table are calculated can be found beneath the portfolio table. You may add more than one transaction for the same fund using Add Transaction button. You can view the detailed transaction for each fund by clicking on (clicking it again will hide the transaction details back up). The remaining units, cost basis and cost basis/unit, realized and unrealized gain/loss, and total dividend received (if any) will be displayed for each mutual fund. You may edit () or delete () a particular transaction by clicking on the respective icons on the right hand side. The dynamic average cost line shows how your average cost for each fund changes over time. 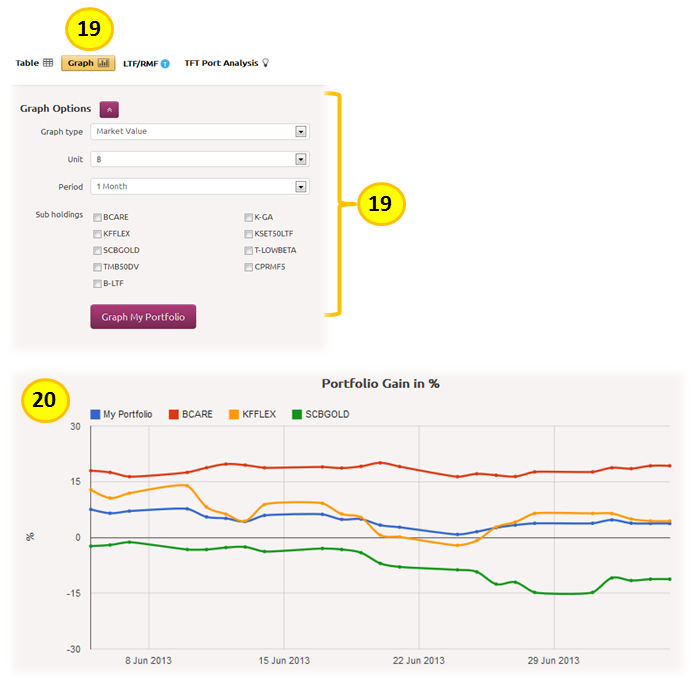 If you would like to view your portfolio data in a graphical format, click on the Graph tab and the graph options for your portfolio will appear. You can plot the market value or the gain (in ฿ or in %) of your entire portfolio or of just a selected group of funds of your holdings over a specified time period. Click on the Graph My Portfolio button and a graph will show up underneath the graph options form. Easily track your LTF/RMF purchases with our LTF/RMF tracker. The LTF and RMF purchases are listed in two separate tables. Set the target amount you want to purchase each year and see how much more you have to buy before the end of this year to help you save on taxes. TFT Port Analysis helps you see the big picture! Your portfolio composition is displayed on three pie charts (and three bar charts) categorized by fund symbol, fund type and institution. In the bar charts, your holdings (top 5 only when categorized by fund symbol) are shown in detailed on two bars, the top one displaying the cost and the bottom one the current market value.